You asked, and we listened! The nature trail at Meadow Mountain Ranch will now be available for troops to use without a property reservation, and troops will be able to go to Meadow Mountain Ranch for the day and hike the trail. Troops will be able to request a date or dates that they would like to hike the trail up to six months in advance by going to https://gscolorado.formstack.com/forms/mmr_nature_trail_request. Requests will be considered based on the availability of the property and if any other requests have been received. Requests are not guaranteed, and will be considered on a first come, first-served basis. If a request is approved, troops will be charged $10 for use of the trail, which will go to the upkeep of Meadow Mountain Ranch and the Nature Trail. If a troop or service unit has reserved the full property, they will have full access to the nature trail without an additional charge. What is the Nature Tail at Meadow Mountain Ranch? It’s a one-way 21-stop guided journey along the north lateral moraine up to the top of Vista Spur with its nearly circular panoramas of high mountain peaks. Trailgoers experience history, geology, biology, math, and science, along a seasonal journey. You will learn about plants, flowers, animals, rocks, trees – all with a view! 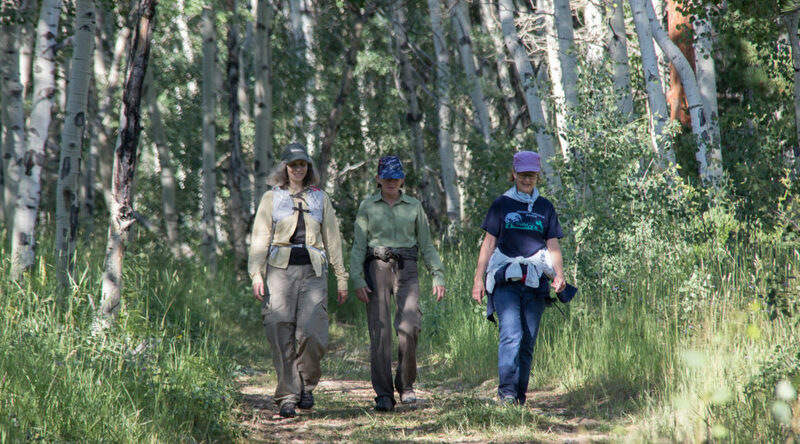 What’s the best way to enjoy the Nature Trail? Plan on two – four hours for maximum immersion and to accommodate all experience levels. Pick up a seasonal guide book and reference materials from Homestead House. Start the trail at the wooden kiosk on the right side of the main road west of the Lodge across from Nature Nook and end the trail at the C.I.T. House to the east of main camp. Plan for uphill and flat sections. The goal is to complete as many activities as possible. Use a guide book for each season and stop at each numbered post for information and activities. Groups of eight-ten are ideal, so everyone can see and hear at each station. Bring water and snacks and day pack to hold your stuff. There are benches to sit on about half way up and at the top of Vista Spur. A walking stick is helpful and winter boots or snowshoes are needed in winter. Watch for sudden weather changes; think you’ll need a raincoat? Maybe! The complete patch set is a five-segment, 4” square colorful seasonal collection. Anyone can purchase the central circle patch to show your pride in MMR, but you must complete a seasonal series of activities to earn any of the other four segments. You’ll need to hike the trail and complete that season’s activities from the guide books. 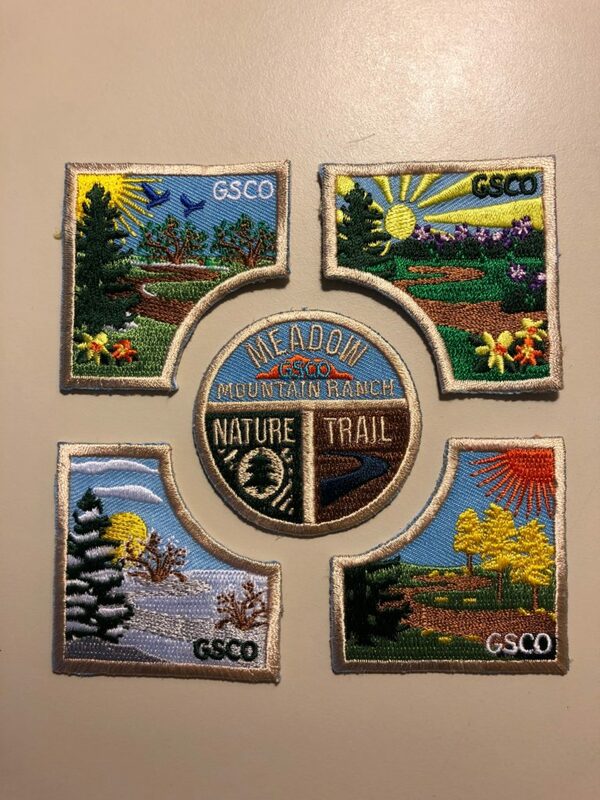 Each segment costs $1.50 and patches are available for purchase in the GSCO Retail Shop. Women’s Week at Meadow Mountain Ranch (MMR) is the most fun you can have at camp since you were 11-years-old! I promise! Even if you have never been to camp before you will “Make New Friends” (there’s me singing!) and do new things. If you are a seasoned veteran of this or all or any other camps, I promise a unique mountain experience of fun and adventure of our own making. The information flyer is at the bottom of this blog post. Registration for Women’s Week 2019 (July 15 – 18) is open now! Besides that huge variety of activities possible, we always have great food, thanks to Susan Baker and her food service team who help us experiment with cooking in the outdoors. If you have a favorite activity, craft, hike, song you’d like us to include in the time at camp, just let me know and we’ll get it scheduled. If you can offer a special craft, music, ceremony, or other fun program, let me know that, too, and we’ll set it up for you. All of MMR is open to us this year, including the Pinecrest Unit for the folks looking for a different view or a little more solitude. The flyer mentions a variety of new offerings if interest is there. Opportunities for service projects for the camp can be arranged as well. Of course, if you are hoping for some true get-away time from your usual hectic lives, this is the opportunity. Chill, rest, relax, play, enjoy. Immerse yourself in the beauty and unique mountain environment. Water, grass, trees, sky, flowers, rocks – – – even dirt if you’d like to play in it! The event is open to any woman at least 18 years of age. Some of the multi-generational teams who have come like moms and daughters (mine included), aunts, and granddaughters have had the best bonding time imaginable. I’d highly recommend it. Bring your old camp friends, bring your stressed-out co-workers, all are welcome and the more the merrier! Having just ladies there gives us a special liberating experience from most anything else in our lives today. Sharing our huge variety of lives and experiences helps us all gain truly long-lasting perspective and lets us return home anxious for next summer already! Gals have come from all over the country from Maine to Washington, including Arizona, California, Hawaii, Connecticut, Utah, Kansas, Texas, and many other states. The word is spreading about how much fun Women’s Week is and we’d love to have you join us. Special needs can usually be accommodated easily. The camp is glorious and truly one of our favorite places on earth. My contact information is at the bottom of the flyer and I serve as director, registrar, and I’ll even do dishes when my patrol’s turn comes up! Nature Trail: Learn about the new seasonal patch program, ONLY at MMR! Meadow Mountain Ranch (MMR) near Allenspark is launching a new patch program to be used in connection with the Self-Guided Nature Trail. A one-way, 21-stop trail through the high country Girl Scout camp gives individuals and groups a chance to explore the natural world and earn beautiful new patches to be placed in a colorful four-season display. Here’s how it works. There is a guidebook for each season of the year. Plan on spending at least two hours or more to complete the program on the trail. Right now, we are rapidly approaching the fall season, so pick up that fall pamphlet. Then, go down the main road to the west of the main camp area to the wooden kiosk on the right side of the road near the Nature Nook/Lyra Activity Shelter. Groups must have a property reservation to use the nature trail, and nature trail booklets are available on-site when groups check in for their reservation. The trail takes you up the hill and through the aspen groves and pines up to a level stretch, and then a cut-off takes you up to Vista Spur at the top of the ridge on the north boundary of the camp property. Stop at each numbered wooden post and read in the book to see what the focus of that stop is. There are things to see, smell, study closely, and generally immerse yourself in the natural world. 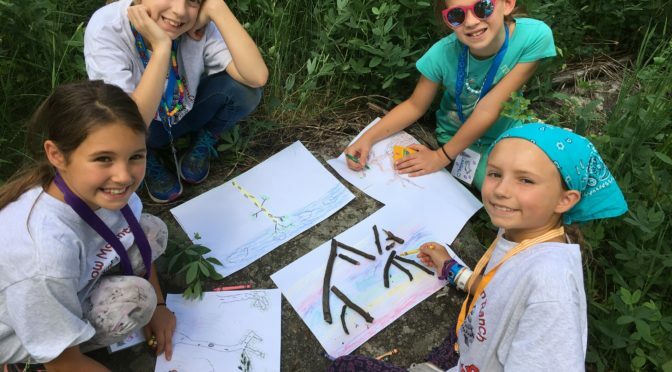 The more time you have to experience everything the Nature Trail has to offer, the more you will come to learn about the history, biology, geology, math, and science of all kinds at the camp. Animals and plants, trees and flowers, rocks and grass, mountains peaks and valleys, stories, and songs are all highlighted. There are even some recipes for great snacks to create! So, once you’ve completed the trail, you will be eligible to purchase that season’s quarter patch which can surround the circle patch in the center of the group. Anyone can purchase the center circle patch, just because you love MMR and like the whole idea of the Self-Guided Nature Trail. Patch pieces cost $1.50 each, for a total cost of $7.50 per complete set, and are available for purchase at the GSCO Retail Shop. The idea is to come to MMR, walk the trail in all four seasons of the year, and expand your horizons with every experience. Time required runs from two to four hours and it’s recommended that groups of 10-12 or less would be optimum for all participants to enjoy each stop. Be prepared with a water bottle, season-appropriate clothing such as raincoat in the summer and warm jackets in the winter. Snowshoes might be needed in deep winter in those heavy drifts. Good shoes or boots are highly recommended and walking sticks might be good too. A snack is also a good idea so you don’t run out of energy before you finish the trail. For further information, contact Penny Roberts or other trail creators or David and Julie Fischer, property managers at MMR. Come join the fun! Are you interested in learning about horses, new to horses, never ridden or have ridden some, earning a new badge, or just love horses? Join us for hands-on horse activities, learning stations, a scavenger hunt, and horseback riding at the Rocky Mountain Horse Expo (RMHE). Girl Scout Juniors can also complete requirements towards the Horseback Riding badge. Take home a fun, fact filled horse workbook plus handouts and giveaways from the Rocky Mountain Horse Expo. There is also a special session for Girl Scouts who have never ridden before. Please contact us for more information. Date: Saturday, March 10, 2018 from 9 a.m.-noon and 1-4:30 p.m.
□ Registration: $40 for the Youth Horse Experience, admission into RMHE for 1 girl and 1 adult, and 2 tickets to the Mane Event. □ Extra tickets for Expo and Mane Event are $10 with combo pricing. Horse breeds scavenger hunt – this scavenger hunt will take you around the Expo to learn about famous breeds of horses from around the world as well as horse feed and nutrition. Equine Art in the Park -Gallery – tour the art gallery to view top horse and cowboy artists from across the United States. Other riding disciplines to learn about could include Vaulting, PoloCross, outfitting/packing, etc. Other industry professionals to learn about could include veterinarian, farrier, etc. The “Mane Event”: Finish the Day with a magical evening performance with nearly 100 horses dancing, spinning, leaping and showing us what remarkable creatures they are, along with many more family friendly activities. 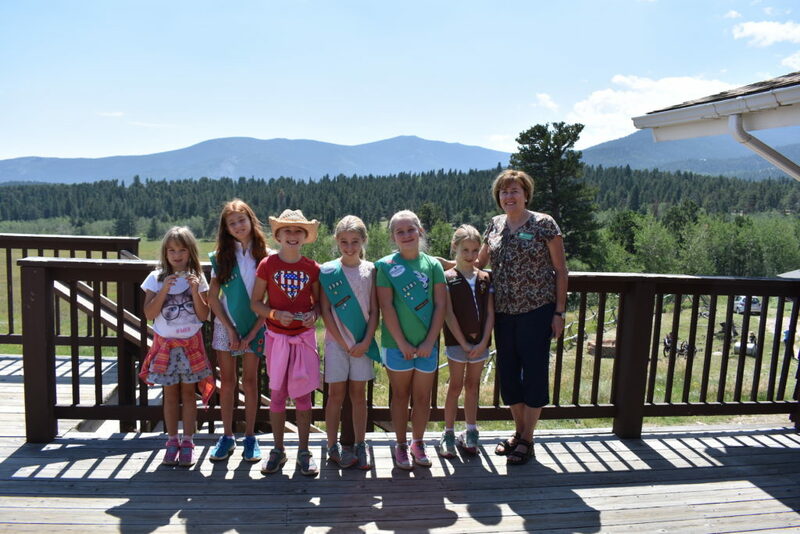 Volunteer-run core camps at Meadow Mountain Ranch this past summer enticed almost 200 girls to the Colorado high country to hike, cook out, sing, do crafts, archery, kapers, and generally, get a really broad sampling of what Girl Scout Camp is all about. The two-night Core Camp (CC for short) gave less experienced troops a quick overview of a variety of program offerings and expert volunteers were there to take the lead in making that program a success. Leaders did not need to worry about planning or scheduling, organizing or executing parts of camp program they might not be quite as knowledgeable about. Most of the volunteer staff had been camp counselors or camp directors before, even as far back as the 1960s. They were truly excited to share their favorite things of camp to new girls and leaders. Included in the short time at camp were archery, outdoor skills, crafts, hiking, cookouts, campfires, nature activities, kapers (camp chores), ceremonies, etc. Add into organized sessions was plenty of free time to hang out with troop friends (“me time”), make new friends, sleep in the tabins in the units, and enjoy the beauty and mountain environment of one of the most beautiful Girl Scouts camps anywhere. Core Camp 2, a three-night camp, offered more time for more fun. This year a pilot program of beginning backpacking skills was offered, and a good group of girls had a mini-trip to the back meadow with packs to see what great adventures might await when we get away from main camp. Extended craft sessions, a little more time for organizing and preparing for the cookout, and night-time activities were offered. The same volunteer staff members were on tap to help girls and leaders have even more fun, and certainly the goal is to have more girls come for three nights next year. Highlights of Core Camps included “Art in the Park,” a nature immersion session, where girls and leaders were able to draw or paint out in the woods their personal interpretations of the beauty of nature and then display their works in a fresh-air art gallery where they shared with the visitors the spirit behind their masterpieces. Of course, they get to take their art works home with them. The “Partner Scavenger Hunt” allowed pairs of girls and adults an extended time outdoors finding things, writing poetry, creating musical instruments from things in nature and also sharing their favorite experiences with the whole group. Crafts in the Paint Pot activity shelter included various selected offerings such as beadwork, memory boxes, dream catchers and more. The outdoor skills program offerings allowed girls experiences with knot tying, fire building, lashing, orienteering, plant identification and more. A lot was crammed into these sessions, but the very experienced volunteers sparked a lot of interest and enthusiasm. There was a “Meadow Meander” which allowed a couple of groups a special opportunity to immerse themselves in the tall, tall grass in the middle meadow and take a closer look at the flowers, bugs, leaves, trees and just lie quietly and take it all in. “What’s that?” “What kind of flower is that?” “Why does this look like thisl?” “Where did that come from?” Exploration and satisfaction abounded, and allowed for some fabulous photo ops, too, to allow us to share the moment and make memories to last a lifetime. The archery area was busy all day with rotations of all the girls and leaders, led by experienced staff members who gave instructions and made sure that what might be a new activity for some would prove to be a complete success for everyone, adults included! For information or to make registrations contact Linda Robinson, registrar, at meadowmountaincorecamp@gmail.com. 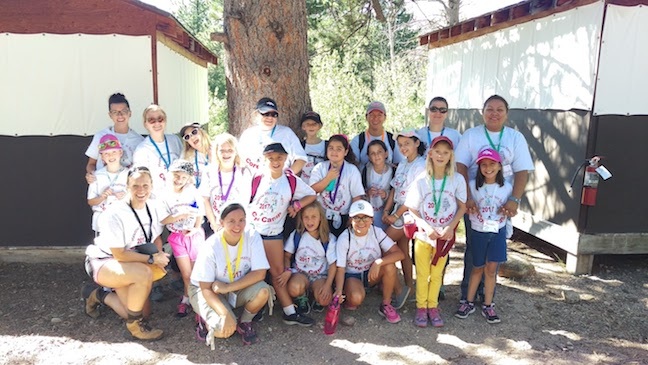 Submitted by Claire J. and Anna L.
We spent two days and one night at Mountain Meadow Ranch in July 2017 for “Core Camp I.” Our troop had 19 Girl Scout Brownies and Juniors, plus many moms to sleep overnight in the tabins. 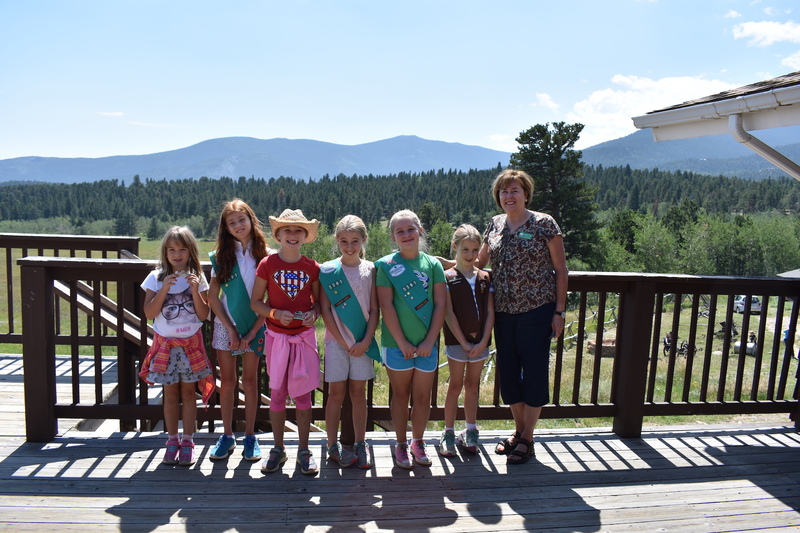 We used a portion of our cookie profits to help pay for this camp, and it was just a short one-hour’s drive to Allenspark, which borders Rocky Mountain National Park.